Photo copyright Warren W. Dexter, 1986. Used by permission. In the 1960s, Henriette Mertz and Corey Ayoob both noticed that the inscription, when inverted from Thomas's orientation to that of the above photograph, instead appeared to be ancient Semitic. The late Semitic languages scholar Cyrus Gordon (1971a, 1971b, 1972) confirmed that it is Semitic, and specifically Paleo-Hebrew of approximately the first or second century A.D. According to him, the five letters to the left of the comma-shaped word divider read, from right to left, LYHWD, or "for Judea." He noted that the broken letter on the far left is consistent with mem, in which case this word would instead read LYHWD[M], or "for the Judeans." Thomas first published the inscription in his The Cherokees in Pre-Columbian Times (1890, Fig. 7), as shown below, but inverted to Gordon's proposed Hebrew orientation. Despite the impeccable detail of this lithograph, there are no signs of the two vertical strokes that now are present in the upper left corner. Thomas (1890, Fig. 7). This image itself is long out of copyright, and so is public domain. This digital scan may be freely used, with a link to this webpage. Both inscriptions do contain two words, with the identical string LYHW- beginning the longer second word in both cases. However, the fifth letter of the second word is clearly different in the two cases. The Bat Creek word ends with a daleth, which also happens to be the second letter of the first word in the Masonic illustration, making the Bat Creek word "for Judea." The Masonic word ends with a second he, which makes it "for Yahweh" instead. The Bat Creek word also has the remnant of a sixth letter, presumably mem, that is completely absent from Macoy's illustration. In fact it is not surprising that two Hebrew inscriptions would both contain the string LYHW-. The common prefix L- simply forms the dative case, indicating for, to, or belonging to the word that follows. The string YHW-, or Yahu-, the first three letters of the name YHWH or Yahweh of the Hebrew God, is a common theophoric component of Hebrew names. Judah or Yehud (YHWD in the Persian era, according to Gordon) is one such "Yahwist" name. A modern example of such a name is that of Benjamin Netanyahu, prime minister of Israel from 1996-1999 and 2009-present. The January/February 2006 Biblical Archaeology Review happens to contain a photograph of a bulla (seal impression) that was recently excavated from Jersualem's City of David under the supervision of Hebrew University archaeologist Eilat Mazar. 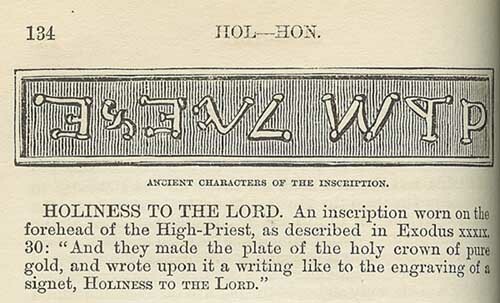 The inscription, in Old Hebrew letters closely related to those in the Macoy illustration, begins with the Masonic string LYHW- in the word LYHWKL, or "belonging to Yehucal" (Mazar 2006: 26). The second line actually contains the tell-tale string -YHW again, in the name of Yehucal's father, ShLMYHW or Shelemiyahu. However, the presence of the string LYHW- on both the Yehucal bulla and the Masonic illustration does not prove that the Mazar assistant who supposedly found the new bulla cribbed it from Macoy's book, but merely that this is a common component of Hebrew inscriptions. Likewise, the presence of this string on Bat Creek does not require it to have been copied from Macoy. The shorter first words of the Bat Creek and Masonic inscriptions are also clearly different, the Bat Creek word having two letters and the Masonic word three. The distinctive W-like shin of the Biblical QDSh (Qedosh) is entirely missing on Bat Creek. The first letters of the two words do have essentially the same form, but are in fact different: In Macoy's illustration, this is clearly meant to be a qoph, but as such is not well made, since in Paleo-Hebrew it should have, in addition to a loop on the right, an arm to the left with an uptick at the end. This arm in fact appears on the second Bat Creek letter, which was consequently identified by Stieglitz as a qoph. Since this alternate form of Q is already present on Bat Creek, the first letter must be something different, and makes most sense as an inverted (rho-wise) resh, as originally proposed by Mertz. The second letter (D) on the Masonic inscription does look a little like the second letter (Q) on Bat Creek, but in fact there is already a D on Bat Creek, at the end of the second word, that looks nothing like the second Bat Creek letter. These are therefore different letters as well. However, the most telling difference between the Bat Creek and Masonic inscriptions is in the different ways the two words are separated. Macoy's illustrator, who was undoubtedly working from a newly-available dictionary chart of Jewish War coinscript letters to transcribe standard Square Hebrew into the older alphabet, erroneously assumed that the words should be separated by a space, as in English or modern Hebrew. Bat Creek instead correctly uses a word divider. There is no way this subtle detail could have been copied from Macoy's illustration, even if the copyist threw in a few random changes to disguise his or her source. If nothing else, the Masonic illustration newly discovered by Mainfort and Kwas does show that Bat Creek has an undeniable affinity to Paleo-Hebrew, and that this affinity should have been recognized already in 1889 by any competent student of antiquities. The fact that Thomas and subsequent American archaeologists failed to see this affinity until it was pointed out by Mertz, Ayoob and Gordon demonstrates their incompetence to adequately classify and evaluate ancient material. It does not, however, reflect on the Mound Survey's data-collecting abilities per se. My reply to the new Mainfort and Kwas article, enumerating these and other considerations, was summarily rejected by American Antiquity as being "far outside the expertise and interests of the readership." It has nevertheless been accepted for publication in Pre-Columbiana, and a PDF of the draft is online at http://www.econ.ohio-state.edu/jhm/arch/AmerAntiq.pdf. Or is it Welsh Coelbren? In 2002, researchers Alan Wilson, Baram A. Blackett, and Jim Michael announced that the Bat Creek stone is in fact inscribed with the the ancient Welsh Coelbren alphabet, and reads, in Welsh, "Madoc the ruler he is." These authors identify the Bat Creek tumulus as "the likely tomb of Prince Madoc" (Wilson et al. 2002). Madoc was a Welsh prince who is reputed to have sailed to America in 1170 A.D. (see, e.g. Kimberley (2000)). However, Wilson et al. maintain that he was in fact a brother of King Arthur II, and sailed in 562 A.D. This would reconcile their reading of the inscription with the C-14 date of 32 A.D. - 769 A.D.
Wilson et al. give no reference for what they regard as an authoritative source for the Coelbren alphabet, and give no indication as to how they read the letters on the Bat Creek stone in this alphabet, or what Welsh words they find there. A Coelbren alphabet is provided online by Serenwen (undated). However, I see no obvious relation of the Serenwen alphabet to the Bat Creek letters. A further complication is that it is widely believed, even among Celtic enthusiasts, (e.g. Jones 2004) that Coelbren itself is the modern invention of Edward Williams (1747-1826), known also as Iolo Morgannwg. 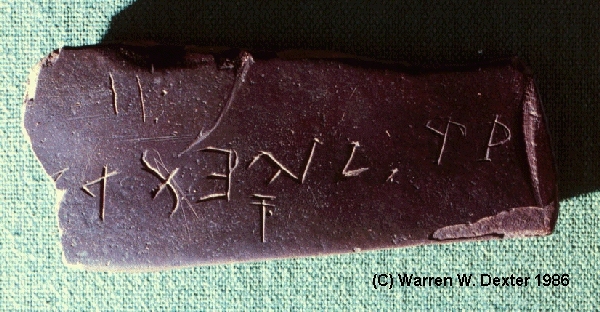 Although Gordon's Paleo-Hebrew reading of the Bat Creek inscription works much better than Thomas's original Cherokee interpretation, the fit as Hebrew is by no means perfect (McCarter 1993). If it could be shown to work even better as Coelbren, or any other alphabet, the Hebrew reading would have to be abandoned. Furthermore, if the Bat Creek stone, which was professionally excavated and whose context been carbon-dated to ancient times, were clearly engraved in Coelbren letters, that would itself be sufficient to vindicate the authenticity of Coelbren and to exonerate Morgannwg. However, until Wilson et al. publish the details of their claim, there is no basis for either of these conclusions. Since the above was written, Wilson et al. have published a book with details of their analysis, which I have not yet had time to critique. The Bat Creek stone long lay out of sight in a back room of the National Museum of Natural History in Washington, D.C., but currently it is on indefinite loan to the McClung Museum of the University of Tennessee, Knoxville, where it is prominently on display. The findspot was about 40 miles south of Knoxville, in what is now a TVA recreational area on the shore of Lake Telico at the mouth of Bat Creek. The mound itself has been plowed flat, and only its approximate location is known. Perhaps the TVA could be prevailed upon to mark a path from old highway 72 to the approximate site, possibly making a complete loop around High Top, with a spur trail to the summit. A picnic table and a small sign at the approximate site of the mound would make an appropriate memorial for the find, as well as a pleasant destination for hikers and boaters. Even more ambitiously, the mound and its vegetation could be reconstructed at a plausible spot. Bat Creek Mound #3, with the inscription and 9 burials, was "of small size, measuring but 28 feet in diameter and 5 feet in height," according to the offical report. Rebuilding it would require only about 38 cubic yards of earth. The mound had some large sassafras trees standing on it when it was exacavated. The owner stated that he had cut trees from the mound 40 years before the excavation and that it "had been covered by a cluster of trees and grapevines as long ago as the oldest settler in the locality could recollect. At the time the excavation was made there was an old rotten stump yet on the top, the roots of which ran down to the skeletons." A 3-foot black oak tree still stood on nearby Bat Creek Mound #2 at the time of excavation, so it is not unlikely that Mound #3's trees were of the same type. A cluster of black oak and sassafras trees, along with some grape vines, planted on the rebuilt mound, would therefore provide an authentic invocation of the 19th century setting, as well as shade for picnickers. 1. Our geological findings are consistent with the Smithsonian Institute's field report written by John W. Emmert. 2. The complete lack of the orange-colored silty-clay residue in any of the characters of the inscription is consistent with many hundreds of years of weathering in a wet earth mound comprised of soil and "hard red clay." Archaeologists have yet to react to this new study. Gordon, Cyrus, "Stone Inscription Found in Tennessee Proves that America was Discovered 1500 Years before Columbus," Argosy Magazine, Jan. 1971a. Reprinted in Ancient American Vol. 14, No. 88 (Sept. 2010). Carried by Barnes and Noble bookstores. Gordon, Cyrus, Before Columbus (New York, Crown, 1971b), Appendix. 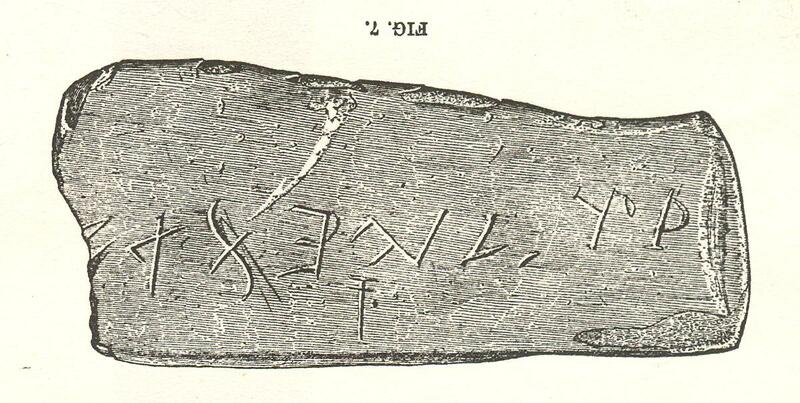 Gordon, Cyrus, "The Bat Creek Inscription," in C.H. Gordon, ed., The Book of the Descendants of Doctor Benjamin Lee and Dorothy Gordon, pp. 5-18. Ventnor Publishers, Ventnor, N.J., 1972. Jones, Mary, "Edward Williams/'Iolo Morgannwg'," a page of Jones' Celtic Encyclopedia, at www.maryjones.us/jce/iolo.html. Dated 2004, accessed 12/28/05. Kimberley, Howard, "Madoc 1170: Were the Welsh the First European Americans?," undated website at www.madoc1170.com/home.htm. Accessed 12/28/05. Kirk, Lowell, "The Bat Creek Stone," a webpage of The Tellico Plains Mountain Press, undated. An alternative online theory of the Bat Creek inscription. Macoy, Robert, General History, Cyclopedia and Dictionary of Freemasonry, Masonic Publishing Co., New York, 3rd ed., 1868, p. 134. (Same illustration is on p. 169 of 1870 edition and 1989 reprint edition; illustration not in 1867 edition). Mainfort, Robert C., and Mary L. Kwas, "The Bat Creek Stone Revisited: A Fraud Exposed," American Antiquity 64 (Oct. 2004): 761-769. Mazar, Eilat, "Did I Find King David's Palace?," Biblical Archaeology Review, Vol. 32 no. 1 (Jan./Feb. 2006): 16-27, 70. Mertz, Henriette, The Wine Dark Sea: Homer's Heroic Epic of the North Atlantic,, Chicago, 1964. McCulloch, J. Huston, "John Emmert, Demon Rum, and Bat Creek: Excavations in the Smithsonian Archives," July 1987. McCulloch, J. Huston, "The Bat Creek Inscription -- Cherokee or Hebrew?," Tennessee Anthropologist 1988(2), pp. 79-123. See also comment by Robert C. Mainfort, Jr. and Mary L. Kwas, TA 1991(1), pp. 1-19, reply by JHM TA Spring 1993, pp. 1-16, rejoinder by M&K, TA Fall 1993, pp. 87-93. A pamphlet containing these articles is available for $6.00 from the McClung Museum bookstore. McCulloch, J. Huston, "The Bat Creek Inscription: Did Judean Refugees Escape to Tennessee?" Biblical Archaeology Review July/August 1993, pp. 46-53 ff. See also comment by P. Kyle McCarter, BAR July/August 1993, pp. 54-55 ff., reply by JHM BAR Nov./Dec. 1993, pp. 14-16, and numerous letters, esp. those by Robt. R. Stieglitz and Marshall McKusick, in the Nov./Dec. 1993 and Jan./Feb. 1994 BAR . McCulloch, J. Huston, "The Bat Creek Stone Revisted: A Reply to Mainfort and Kwas in American Antiquity," Feb. 2005. Forthcoming in Pre-Columbiana. Click on link for PDF file. Serenwen, "Coelbren Ar Beirdd," undated webpage at http://druidry.org/obod/lore/coelbren/coelbren.html. Accessed 12/29/05. Stieglitz, Robert R., "An Ancient Judean Inscription from Tennessee," The Epigraphic Society Occasional Publications, vol. 3 (part 2, article 65, 1976): 1-5. Thomas, Cyrus. The Cherokees in Pre-Columbian Times, N.D.C. Hodges, New York, 1890. Thomas, Cyrus, "Mound Explorations," in Twelfth Annual Report of the Bureau of Ethnology to the Secretary of the Smithsonian Institution, 1890-91 (Washington, GPO, 1894), pp. 391-4. [Wilson, Alan, Baram A. Blackett, and Jim Michael], "Did the Welsh Discover America," unsigned online press release at www.rense.com/general28/weks.htm, dated 8/28/02. Accessed 12/29/05. Wolter, Scott, and Richard D. Stehly. "Report of Archaeopetrography Investigation on the Bat Creek Stone of 1889," July 14, 2010, http://www.ampetrographic.com/files/BatCreekStone.pdf. Reprinted in Ancient American Vol. 14, No. 88 (Sept. 2010). Thanks to the late Warren W. Dexter, author with Donna Martin of America's Ancient Stone Relics , Academy Books, 1995, for permission to use the above photograph of the Bat Creek stone. Another of Dexter's excellent photographs of the inscription appears in BAR July/Aug. 1993, p. 46. Dexter passed away Dec. 4, 2007, at 96. This site received 4664 visits, 11/1/04 - 12/26/05. Annoying "free" hitcounter removed 12/26/05.